My Chess Apps: Live chess on the web has a new address! 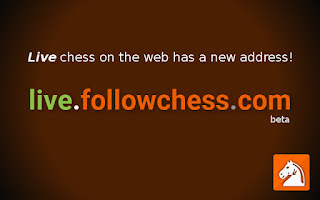 Live chess on the web has a new address! ♞ Analyze This iOS got improved support for annotated games and several bug fixes. ♞ Analyze This Android got critical bug/crash fixes related to game saving. ♞ Follow Chess iOS had a bug related to multi board refresh which went unseen for a while. We fixed that too! ♞ Chess Book Study iOS got support for loading your own PGN files! (finally!) So now its easy to study Chess books and magazines. ♞ Your Move app which is currently on Android, will also be coming to iOS (its with Apple for approval...sshh)! 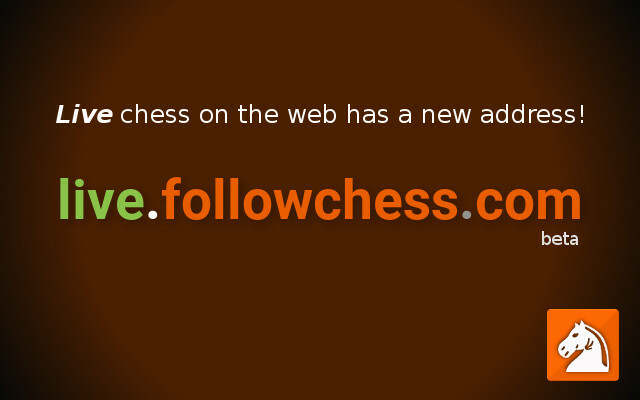 But the most exciting and well received, was the news about Follow Chess (Beta) on ANY browser! Just type live.followchess.com in your browser and enjoy live games from top tournaments in a mobile/tablet friendly manner. Currently its a "lite" version and does not have all the bells and whistles of the Android & iOS Apps. But its a big step for us as well, since its our first product to be publicly available via a Browser! Any hey, like all our products, its just a matter of time and even this "lite" will get new features and updates! titbit: This project was conceived as part of our "Tech Tuesday", where we work on some different challenging ideas every Tuesdays! I am personally very happy to see a side-project become something more. But what excites me more is the potential it has to further improve how we all experience Chess.